The Terrocotta Army exhibition is so popular that British Museum is planning to extend the opening hour to midnight, even 24 hours a day, to accommodate the visitors. Almost all of the half million pre-book tickets have been sold. There are 500 on-the-day tickets every day. ‘The First Emperor: China’s Terrocotta Army’ exhibition is becoming the second most popular exhibition of British Museum, only beaten by the Tutankhamun exhibition in 1972. The British Museum is planning to take the unprecedented step of staying open 24 hours a day to meet the huge demand for its exhibition of Chinese terracotta warriors. The demand to see the terracotta warriors is so great that the British Museum is planning 24-hour opening. Total visitor numbers are expected to exceed 800,000 - more than twice the figure predicted when The First Emperor opened in September. Some of the photos of Dong Yi’s Zheng Recital at the Great Hall of the People, Beijing. Photos courtesy of the concert organisers. Dong Yi is a graduate of Edinburgh University, and a postgraduate student of London School of Economics and Political Science. 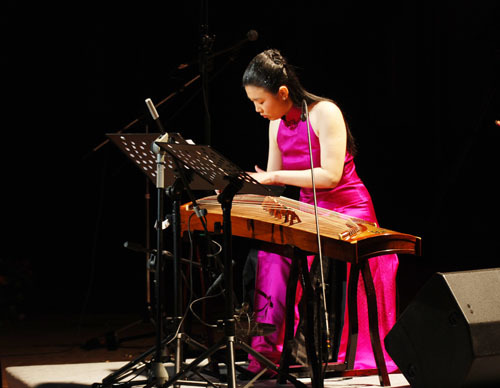 More about Dong Yi’s Zheng Recital at the Great Hall of the People, and the concert programme. Chinese parents are more anxious than their ‘little princesses’ to find a date for them. Aileen McCabe of CanWest News Service reports the phenomenon of the Blind Date Corner, attended largely by the parents. SHANGHAI — It’s many a young girl’s worst nightmare. Her parents are trying to line her up with a blind date. Worse, they post a sign listing her attributes and print pamphlets to hand out to anyone interested. “My daughter would kill me if she knew,” one chatty mother confides, refusing to give her name just in case her offspring catches wind of the scheme. But she will readily hand over a flyer describing her daughter, complete with picture. Simon Hattenstone reports in the Guardian the story of Sandy (Jing Zhou) who, as many in the similar situation, is caught between the retrospective policy change by the Home Office, and the refusal of her employer to raise her hourly wage from £6.15 to £7.02. Having been working as a senior care worker for four years, she is now facing deportation. After four years in a Southern Cross care home, helping elderly people get on with their lives, Sandy, who is from China, was planning to apply for indefinite leave to remain in Britain. She assumed it would be a foregone conclusion. After all, she was doing vital work, paying her taxes, and her daughter was slap-bang in the middle of A-levels. But in July this year she received a letter from the Home Office. It stated that senior care workers no longer qualified for work permits. The Home Office had re-assessed the job, decided it was insufficiently skilled to warrant a permit, and that Sandy would have to return to China in October. The New China: What does the First Emperor’s legacy mean in a globalised world? The Guardian/ British Museum forum will be chaired by Jon Snow, writer and broadcaster, with an introductory speech from Neil MacGregor, director, the British Museum. Other speakers include Jonathan Fenby, writer and China expert, Sun Shuyun, author and film-maker and Steve Tsang, fellow, St Antony’s College, Oxford. The award ceremony of the 2007 Pearl Awards was held at Royal Festival Theatre on 1 Nov. The Pearl Awards, inaugurated in 2004, is the first award to celebrate the archievement and recognise the work of Chinese community in the UK. When Jackie Chan was electronically beamed across the wonderfully cavernous auditorium that is the Royal Festival Hall, a wave of palpable excitement rippled through the air. “I am sorry I am not in London as I am filming in China, but I am so happy to be associated with the Pearl Awards,” the internationally popular actor began. His eyes twinkled at the end of his message as he addressed HRH The Prince of Wales, “If you ever want to learn kung fu, give me a call, and I’ll come straightaway!” We cheered and clapped our approval, and so did the Prince. That reflected the delirious mood of the evening. This was the Pearl Awards’ most high profile outing since its inception four years ago by its charismatic founder, William Ong. UK Home Office announced that from the first quarter of 2008, when the points based system will be introduced, applicants will be required to demonstrate their English level. Individuals will be asked to provide evidence that they have passed an English language test.